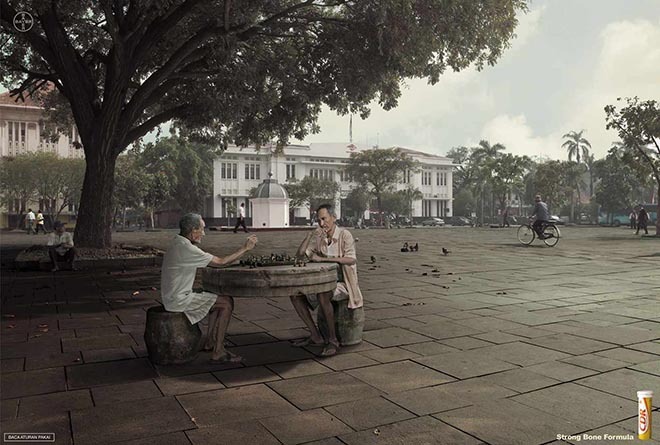 Bayer Indonesia is promoting CDR (Calcium D Redoxin) with a print advertisement demonstrating the product’s capacity to build strong bones. Two men sit at a stone table playing chess, without the help of table legs. The tag line: “Fórmula huesos fuertes” or “Strong Bone Formula”. The CDR Chess Table ad was developed at JWT Jakarta by executice creative director Juhi Kalia, creative director Randy Rinaldi, art director Leonard Wiguna, copywriter Anton budi Santosa, and agency producer Gina Virginia. Photography by Clarissa+Peddy was retouched by Kaisar.